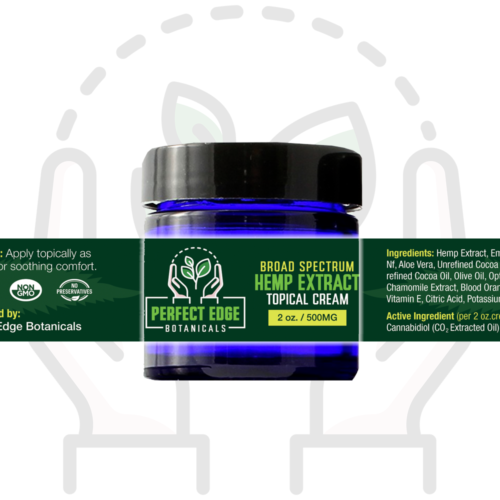 Perfect Edge Botanicals 500mg Hemp Extract Topical Pain Cream. Give your body the relief it needs! This topical Pain Cream has 100% organic phytocannabinoids, essential terpenes and organic coconut oil. Specially formulated to reduce inflammation, ease joint pain and relieve muscular aches. Great for after a workout or if you suffer from arthritis or joint pain. Has shown to provide relief from nerve damage (Neuropathy), as well. Perfect Edge Botanicals 500mg Hemp Extract Topical Pain Cream is an all natural CO2 hemp extract topical cream. Infused with quality natural essential oils, as well as aloe vera, cocoa butter and olive oil. Absorbs quickly and has a bright fresh scent. This product is laboratory tested. Hemp Extract can help with a multitude of ailments, symptoms, syndromes and diseases. Perfect Edge Botanicals Hemp Extract Topical Pain Cream also contains natural Hemp Plant Terpenes for added benefits. Broad Spectrum Hemp Extract, Emulsifying Wax NF, Aloe Vera, Unrefined Cocoa Butter, Unrefined Cocoa Oil, Olive Oil, Optithen Plus, Chamomile Extract, Blood Orange Oil, Vitamin E, Citric Acid, Potassium Sorbate.